After the Las Vegas mass shooting – it’s days like this when the world feels like it is falling apart that we tap into our resilience and inner strength to feel, mourn and transform even through the pain. For peacebuilders, activists and those working on the front lines of social justice and peace – almost every day can feel like this as we are putting our own bodies on the line for the change they hope to see. Connect to yourself and community through story and movement. Experience and practice embodied peacebuilding, trauma healing and somatic awareness. 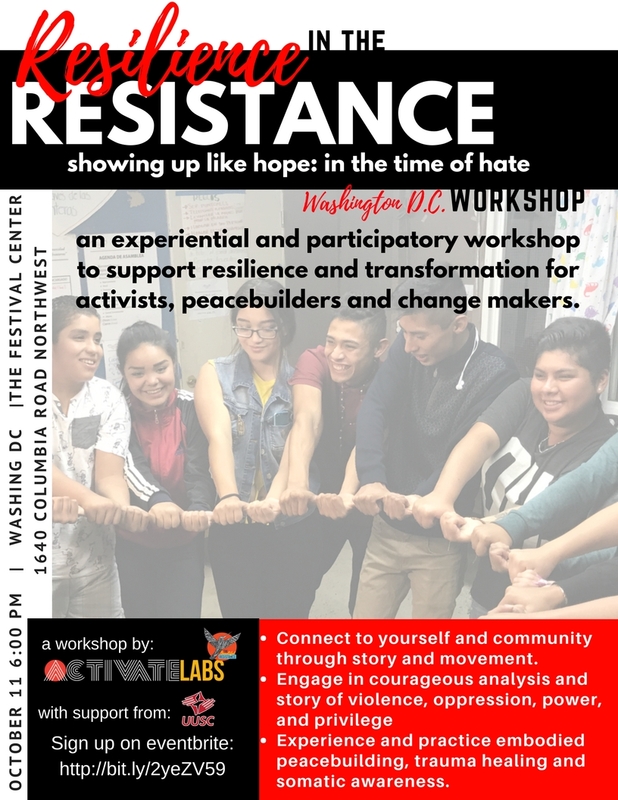 Through embodied somatic exercises, story and experiential participation you will gain skills in self care, non violence and building community so together we can show up looking like hope in a discouraging and hateful time. Resilience In The Resistance: Washington D.C.